You may have seen red noses in your local Walgreens or Duane Reade — but do you know what they're actually for? Here's what you should know about Red Nose Day. 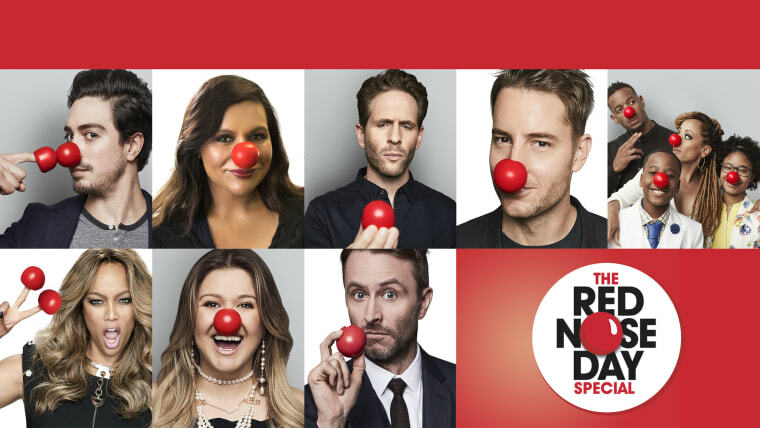 Red Nose Day is a global fundraising campaign founded by the nonprofit Comic Relief. It began in the U.K. in 1988 and came to the U.S. in 2015, with the goal of combating childhood poverty. Celebrities such as Julia Roberts, Jack Black, Ludacris, Michelle Rodriguez, Ed Sheeran have joined the effort. The "Love Actually" cast even reunited for a sequel, "Red Nose Actually!" On Thursday, May 24, 2018 you can tune in to NBC at 8:00 p.m. EST for a night of celebration. This year's host is Chris Hardwick and the broadcast will include a special version of "Celebrity Ninja Warrior" and "Hollywood Game Night". Other celebrities such as Kirsten Bell, Kelly Clarkson, Julia Roberts, Ed Sheeran, Marlon Wayans, Sean Hayes, Ellie Kemper, Zooey Deschanel, Sasheer Zamata, Tony Hale, Jane Lynch, Jack McBrayer, Akbar Gbajabiamila and Matt Iseman will be a part of the broadcast this year. Who does Red Nose Day help? Donations go to partner charities that support the welfare of children in all 50 states, Puerto Rico, Latin America, Asia and Africa. Some of the partner charities and recipients of donations include the Boys & Girls Clubs of America, Children’s Health Fund, Covenant House, Feeding America, Gavi, the Vaccine Alliance, UnidosUS, Save the Children and The Global Fund. How can I donate to Red Nose Day? For starters, Walgreens and Duane Reade both have red noses available for purchase in their stores. You can find your closest store location here. If you don't have a Walgreens or Duane Reade nearby, or want to order a package of red noses for an event or fundraiser, you can place an order online. Packs of 60 or 360 red noses are available at $1 apiece. If you just want to donate to the cause, you can do that, too. Donations are accepted online via credit card or PayPal. The Bill and Melinda Gates Foundation has agreed to match all contributions, online and otherwise, up to $250,000!